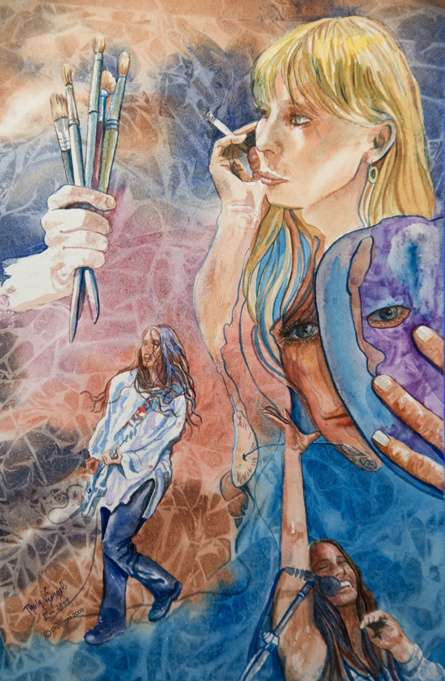 In December of 2008, watercolorist Paula Visnoski took an “Honorable Mention” in the Fifth Annual Manhattan Arts International “Healing Power of Art” online exhibition. The show runs through March 31, 2009. 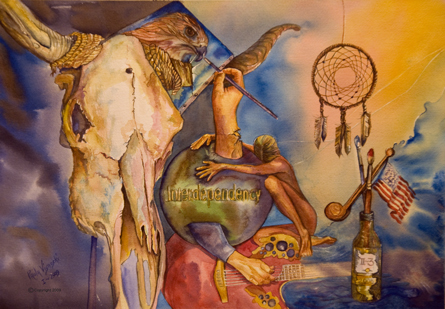 Paula fine artworks has been accepted into the “House of Scratch” February 2009 Juried Exhibition. I have asked Paula Visnoski from New England, USA, to tell me about her life. “All my life I’ve identified myself as an artist. I knew from the time I was five that I had a special talent, that not everyone possessed, and that it brought me a lot of attention. Growing up I always was considered the weird, eccentric, hippy artist in school, the kid that got away with painting a mural on my senior English teachers classroom wall in exchange for an A+ on my senior English term paper! 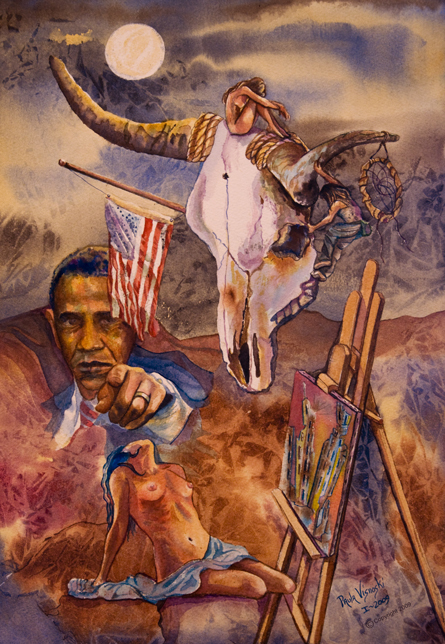 During, and after high school I studied with a watercolorist for about five years. He pointed me in the direction of learning how to get involved in doing shows and marketing my work. I have sold quite a bit of my work over the years and did my share of shows, picking up a couple of awards, and took on a huge amount of portrait commissions to help pay my bills. Also during this time I managed to take some credited college courses and through the years learned Graphic Design and Photography. More than twenty years ago I met a woman musician, Ellyn, we fell in love and lived together for nearly a decade. We both were very young and of course living in the 80’s we both got into the party scene, doing drugs and drinking all the while trying to stay true to our art. It wasn’t until I left my partner of 14 years in 2007 and hit rock bottom with my drinking, that I was able to put the bottle down and begin my artistic journey once again. Ellyn, who had left me in the late 80’ies to get sober, heard about this through a mutual friend and out of the blue, thanks to the Internet we contacted each other through email on the very same day. The rest is history…we reunited and have been together since last May. She has always been a true inspiration to my art, and I, to hers. We needed to go our separate ways for all those years and live very parallel lives with a few bad relationships in between in order to be the women/artists we are today. My recent work has a surrealistic style. Salvador Dali was a huge influence to me in my younger years, as well as Georgia O’Keefe, Picasso, Van Gough and the likes of Sergeant, Homer, Escher, and Wyeth to name a few… I suppose Dali’s style is working through me now, though I have never been locked into a certain style of painting. – My hopes and dreams for my future are that I may continue on with my art and hopefully touch people in a way that makes them have a look into their own spiritual journeys in life”.